legacycentral bbs • View topic - Clocking a VF11? Post subject: Clocking a VF11? Anyone clocked the center - CHRA - of their VF11 to mount it 'upside down' for another application? I've read you must keep the oil INLET on top and OUTLET (drain) on bottom but what about clocking the Compressor and Turbine to allow it to mount to the exhaust manifold from the top vs. the bottom? 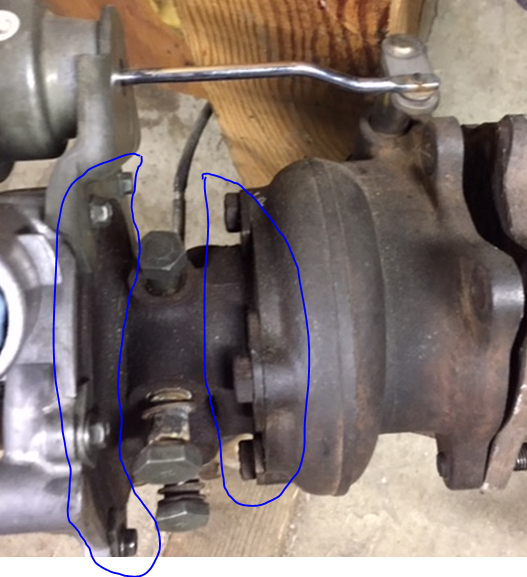 Can I just loosen/remove the bolts circled in blue? Post subject: Re: Clocking a VF11? You can disassemble the turbo so just the center portion is there. It would need to be reassembled and balanced by a shop if you were to use it again.